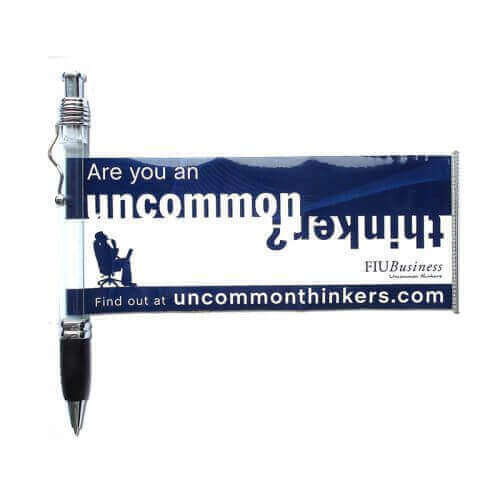 Personalized banner pens are the ultimate in promotional pens. Our unique scroll pens come with the same great benefits of ‘normal’ custom pens but with more space to educate and promote to your customers with their unique pull out banner. Without a doubt the best value for money, personalized banner pens service in the UK. Don’t wait for a formal quote. Get one emailed to you in the next 60 seconds! Request a sample today and test out the quality yourself! With us you only have to order 500 personalized banner pens or scroll pens at a time. We’re experts at this. This isn’t just another product among many others that we offer. With years of experience, we are now one of the largest suppliers of retractable banner pens throughout the UK. We ensure that your fully custom promotional pull out banner pens make it to you on time – not just out our door. Super-fast turnaround times to ensure that they are ready for your event. View our banner pens, prices and instructions on how to place an order.